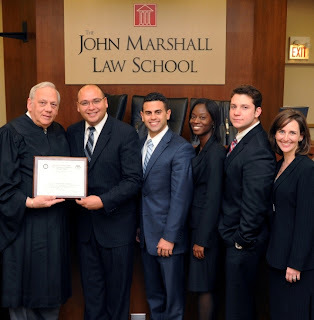 Orlando, Fla. -- Barry University School of Law’s Trial Team defeated Harvard University in the final round to win the ABA National Criminal Justice Trial Advocacy Competition held March 29-31 at The John Marshall Law School in Chicago. Hon. Stanley Sacks, presiding judge of the final round, (far left) presents the championship certificate to Barry’s winning trial team (from left): Aboubakr Maaroufi, Ryan Sainz, Ciara Harris, Victor Zamora and Professor Elizabeth Megale. The win was Barry’s seventh championship at a national competition since 2008. It is also the second championship in the 2011-12 academic year, marking the second year in a row Barry’s Trial Team has won two championships. Barry’s advocates were Aboubakr Maaroufi (prosecution and defense), Ryan Sainz (defense, and prosecution witness) and Ciara Harris (prosecution, and defense witness). The swing witness was Victor Zamora. Maaroufi, a second-year student, was named Best Advocate at the competition, which included 19 teams. Both Harris and Zamora received perfect witness scores in two separate preliminary rounds. Barry went undefeated in the preliminary rounds, beating the University of Alabama, Widener and the University of Puerto Rico School of Law. Only four teams advanced, with Barry facing and defeating Creighton in the semifinals to reach the finals against Harvard. The team was coached by Barry Law professors Mark Summers and Elizabeth Megale. More information on the competition is at http://www.abacrimtrial.com/. Established in 1999, the Barry University Dwayne O. Andreas School of Law in Orlando offers a quality legal education in a caring, diverse environment. A Catholic-oriented institution, Barry Law School challenges students to accept intellectual, personal, ethical, spiritual, and social responsibilities, and commits itself to assuring an atmosphere of religious freedom. Barry Law School is fully accredited by the American Bar Association and has a current enrollment of more than 700 students from around the world. More information is at www.barry.edu/law.